Wikimedia Commons has media related to GT. The main article for this category is Grand tourer. The Audi S5 is the high-performance variant of Audis A5. It is the coupé, and five-door fastback versions of the fourth-generation Audi S4 saloon, like all Audi S cars, they are only available as standard with Audis quattro four-wheel drive system, here in S5 using a Torsen-based centre diff system. Most versions of the S5 are manufactured at Audis plant in Ingolstadt, they are available as a coupé, the cabriolets are built at Audis factory in Neckarsulm, Germany. The Audi S5 was released in form to the public at the same time as the A5. The Audi S5 Sportback was unveiled at the 2009 Frankfurt Motor Show, the Audi S5, in comparison to the A5, features a more aggressive body style which consists of side skirts, bigger air inlets on front bumper and dual-quad tip exhaust. The S5 includes a string of LED daytime running lights around the bi-Xenon headlamps, changes for 2010 model year include LED tail lamps, the introduction of Premium Plus and Prestige trim levels and new optional equipment such as leather/Alcantara seats. Despite sharing the same nameplate, the powertrains were different between the coupé and the Cabriolet/Sportback for the 2010-12 model years, the coupé had a choice of either a 6-speed manual or 6-speed Tiptronic, while the Cabriolet/Sportback have the 7-speed S-tronic dual-clutch transmission. Despite minor differences in power output, both the V8 and the supercharged V6 provide very much similar performance. While the V8 benefits from the power delivery the V6 is more frugal. The only Audi S5 with the V8 engine is the pre-facelift Coupe version, the Audi S5 Coupé uses the 3.0 L Supercharged V6 TFSI engine producing 245 kW, previously used in the S5 Cabriolet and S4 Sedan/Avant since the 2010 model year. The other major change under the bonnet is the introduction of technology for better fuel efficiency. Audi claims a fuel economy of 8.9 litres/100 km. In 2017, Audi replaced the supercharged 333 HP engine with a single turbocharged 183 cu in,2995 cc,354 HP engine, an increase of 21 HP from the supercharged model. The Cadillac CTS-V is a high-performance version of the Cadillac CTS. The CTS-V series includes three styles, all of which feature a pushrod OHV V-8 engine and a sport-tuned suspension. The four-door CTS-V sedan was introduced in 2004, and the CTS-V sport wagon, the first generation CTS-V is based on the same rear-wheel-drive GM Sigma platform as is the base model CTS. The use of a V8 engine required a unique engine cradle distinct from the base CTS V6, larger anti-roll bars and larger shocks were added. The spring rate was significantly increased, the 2006-2007 update included a stronger rear differential and half shaft design. Brakes were 13.97 in rotors in the front, with 14.37 in rotors in the rear - each with four-piston Brembo calipers on the front, in addition, GM badges were added on 2006 models. For performance enthusiasts, a performance suspension package was available as a dealer installed option. The CTS sedan is enhanced with GM performance parts like a GM LS engine V8 from the C5-generation Chevrolet Corvette Z06, the LS family of V8 engines share no common parts with the antique small block V8 Designed by Ed Cole and his team in the early 50s. The block design and head are all clean sheet designs and carry no parts or dimensions other than bore spacing with the old designs and this becomes apparent when comparing the differences between intake and exhaust manifold designs. The intake and exhaust ports are evenly spaced apart unlike the old small block, from 2004 and 2005, the CTS-V came with the 5.7 L pushrod OHV LS6 engine producing 400 hp at 6,000 rpm and 395 lb·ft of torque at 4,800 rpm. The 5 lb·ft torque reduction of the CTS-V vs the LS6 used in the C5 Z06, was due to the exhaust manifold that needed to be used on the CTS-V. From 2006 to 2007, the previous LS6 engine was superseded by the new 6.0 L OHV LS2 engine as used in the base 2005 Chevrolet Corvette. The new LS2 engine was rated at the same 400 hp at 6,000 rpm with the torque of 395 lb·ft at 4,400 rpm. While both engines offer the same HP and torque specifications, the LS2s benefit was a torque band. The only available transmission was the six-speed manual Tremec T56, the rear axle was a Getrag limited slip IRS unit with a 3.73,1 ratio. The Bentley Continental R was a luxury coupé made by Bentley from 1991 to 2003. It was the most expensive car in the world at launch. A convertible derivative, the Bentley Azure, was launched in 1995, as Managing Director of Rolls Royce Motor Cars in the early 1980s, David Plastow could see the potential in the Bentley brand. It had been neglected for the previous 15 years and made up only a small percentage of the companys sales at that time. The first move was to charge the standard Bentley 4 door saloon. They appointed stylists John Heffernan and Ken Greenley to come up with ideas for a new, the fibreglass mock up was displayed at the 1984 Geneva Motor Show in Rolls-Royces Project 90 concept of a future Bentley coupé. The concept was met with a reception, but the Project 90 design was largely shelved as the company began to work towards a replacement for the Rolls-Royce Corniche. During this process, Graham Hull, chief stylist in house at Rolls Royce, suggested the designs before the board for the Corniche, from this point it was decided the Corniche could continue as it was, and efforts would once again be channelled into a new Bentley coupé. In 1986 Graham Hull produced a design rendering of a new Bentley coupé which became the Continental R, based on the Rolls-Royce SZ platform, an aerodynamically shaped two-door coupé body had been styled. John Heffernan and Ken Greenley were officially retained to complete the design of the Continental R and they had run the Automotive Design School at the Royal College of Art and headed up their own consultancy, International Automotive Design, based in Worthing, Southern England. Greenley and Heffernan liaised constantly throughout the process with Graham Hull. The interior was entirely the work of Graham Hull and the small in house styling team at Rolls Royce. The shape of the car was different from the somewhat slab sided four-door SZ Rolls-Royce and Bentley vehicles of the time. The Continental R featured roof-cut door frames, a necessity to allow access into the car which had a lower roofline than its 4-door saloon contemporaries. A subtle spoiler effect was a feature of the rear, the finished car is widely acknowledged as a very cleverly styled vehicle, disguising its huge dimensions and a very well proportioned, extremely attractive, car. The Bentley Continental GT is a grand tourer produced by the British automaker Bentley Motors since 2003. It was the first car released by Bentley under Volkswagen AG-management after their acquisition of the company in 1998, and it shares a platform with the Volkswagen Phaeton. In 1994 Rolls Royce Motors previewed a convertible concept car at the Geneva Motor Show - the Concept Java, the car was designed to be a highly desirable Bentley, but smaller, more affordable, yet still exclusive in order to maintain the integrity of the brand. It was to appeal to a new range of potential buyers, the Concept Java never made it into production in the form seen in 1994. However the Bentley Continental GT realised the concept of the Java as a more affordable Bentley, whilst external styling is different, the dashboard design was clearly influenced by the Java. The vehicle was unveiled in 2003 Geneva Motor Show, followed by Le Mans,2003 Goodwood Festival of Speed,2003 annual Bentley Drivers Club meeting at Silverstone and it is not a coachbuilt car. As a result, the price at launch was less than the Continental R. Torsen-based permanent four-wheel drive is standard and it will accelerate from 0 to 100 kilometres per hour in 4.8 seconds, and go on to reach a top speed of 318 kilometres per hour. Early models include a choice of 6 body colours,8 hide colours,5 veneer types,4 carpet, the vehicles went on sale in October 2004. The four-door Continental Flying Spur saloon was first displayed at the 2005 Geneva Motor Show, the Flying Spur utilizes most of the technical underpinnings of the Bentley Continental GT, and was introduced to European and North American markets in the summer of 2005. Together, the Bentley Continental GT and Flying Spur have boosted Bentleys annual production from around 1,000 units in 2003, the Flying Spur has a 6-litre, 12-cylinder engine, configured in a W formation. Unlike a conventional 12-cylinder engine with two banks of six, the Continental’s 6-litre engine is configured in two banks of VR six cylinders each and this shortens the W-12 engines length considerably, compared to a two-bank configuration. The Aston Martin DB9 is a British grand tourer first shown by Aston Martin at the 2003 Frankfurt Auto Show. Available both as a coupe and a known as the Volante, the DB9 was the successor of the DB7. It was the first model built at Aston Martins Gaydon facility, the DB9, designed by Marek Reichman and Henrik Fisker, is made largely of aluminium. The chassis is the VH platform whilst the engine is the 6. 0L V12 from the Aston Martin V12 Vanquish and it has a top speed of 295 km/h and a 0 to 97 km/h time of 4.1 seconds. The DB9 is rated well by car critics, who appreciate the cars interior and exterior design, in spite of comments regarding the DB9s weaker engine and handling, reviewers liked the cars ride and driving experience. Some held issue with the DB9s small rear seats, cargo space, by 2012 the latest version had seen many improvements to the design, the engine and the overall driving experience. It now had 517 PS and 620 Nm of torque from the engine, production of the DB9 ended in 2016 being replaced by its successor, the DB11. Aston Martin Racing adapted the DB9 for sports car racing, producing the DBR9 for FIA GT1 and these two cars are lightened DB9s, the interior features are removed and the aluminium body panels are replaced by carbon fibre panels. Additionally, the engine has been tweaked in both the cars to produce more horsepower, the DB9 was designed by Henrik Fisker, and was first revealed at the 2003 Frankfurt Auto Show. The letters DB are the initials of David Brown, the owner of Aston Martin for a significant part of its history. Although it succeeded the DB7, Aston Martin did not call the car the DB8 due to fears that the name would suggest that the car was equipped only a V8 engine. It was reported that Aston Martin believed that naming the car DB8 would indicate a gradual evolution, the DB9 is the first model to be built at Aston Martins Gaydon facility in Warwickshire, England. At launch, Aston Martin planned to build between 1,400 and 1,500 DB9s per year, the DB9 was facelifted July 2008. This facelift was mainly the increase in power, to 350 kW. The Audi Quattro is a road and rally car, produced by the German automobile manufacturer Audi, part of the Volkswagen Group. 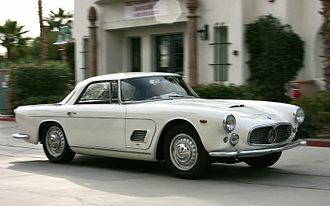 It was first shown at the 1980 Geneva Motor Show on 3 March, production of the original version continued through 1991. The word quattro is derived from the Italian word for four, the name has been used by Audi to refer to the quattro four-wheel-drive system, or any four-wheel-drive version of an Audi model. The original Quattro model is commonly referred to as the Ur-Quattro - the Ur- is an augmentative prefix. The Audi Quattro was the first rally car to take advantage of the changed rules which allowed the use of four-wheel drive in competition racing. It won competition after competition for the two years. The Audi Quattro shared many parts and core components with the Coupé version of the Audi 80 model range. The Quattro was internally designated Typ 85, a code it shared with the quattro versions of the Audi 80 coupé Audi 80. Its characteristic flared wheelarches were styled by Martin Smith, the Audi Quattro had independent rear suspension and independent front suspension. Bensingers idea was to start developing an Audi 80 variant in co-operation with Walter Treser, Audi released the original Quattro to European customers in late 1980, featuring Audis quattro permanent four-wheel drive system, and the first to mate four-wheel drive with a turbocharged engine. The original engine was the 2,144 cc, inline-5-cylinder 10 valve SOHC and it produced 147 kW and torque of 285 N·m at 3500 rpm, propelling the Quattro from 0 to 100 km/h in 7. 1s, and reaching a top speed of over 220 km/h. The engine was modified to a 2,226 cc inline-510 valve, still producing 147 kW. 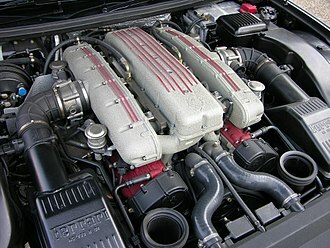 In 1989, it was changed to a 2,226 cc inline-5 20v DOHC setup producing 162 kW. Hence, Quattro models may be referred to as either the WR Quattro, MB Quattro, for the 1983 model year, the dash was switched from an analogue instrument cluster, to a green digital liquid crystal display electronic instrument cluster. This was changed in 1988 to an orange LCD electronic instrument cluster, external styling received very little modification during its production run. The BMW New Six CS is a two-door coupé built for BMW by Karmann from 1968 to 1975. It was developed from the New Class-based BMW2000 CS coupé, the E9 platform, especially the 3.0 CSL homologation special, was very successful in racing, especially in European Touring Car Championship and the Deutsche Rennsport Meisterschaft. This helped to establish BMWs status as a sporty drivers car, the BMW 2000C and 2000 CS were introduced In 1965. Based on the New Class, the 2000 C and CS were Karmann-built coupés featuring the two litre version of the M10 engine. The first of the E9 coupés, the 2800 CS, replaced the 2000 C and 2000 CS in 1968, the CS advantages were thus strictly optical to begin with. The 2800 CS used the 2,788 cc version of the used in the E3 sedans. The engine produced 170 horsepower at 6000 revolutions per minute, not only was the 2800 CS lighter than the preceding 2000 CS, it had a smaller frontal aspect, further increasing the performance advantage. The 2800CS was replaced by the 3.0 CS and 3.0 CSi in 1971, there was a 4 speed manual and an automatic transmission variant. 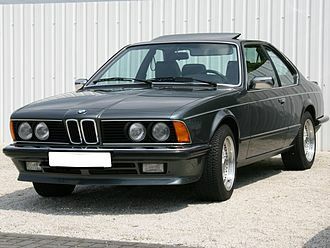 They were sold in the United States from 1970 to 1974 and he was the importer and sole distributor for BMW from the mid-sixties until selling his business to BMW of North America in 1975. 1974 model cars had protruding 5 mile per hour bumpers, introduced in May 1972, the 3.0 CSL was a homologation special built to make the car eligible for racing in the European Touring Car Championship. The L in the designation meant leicht, unlike in other BMW designations, the lightness was achieved by using thinner steel to build the unit body, deleting the trim and soundproofing, using aluminium alloy doors and boot lid, and using Perspex side windows. The CSL was never sold in the United States, initially using the same engine as the 3.0 CS, the 3.0 CSL was given a very small increase in displacement to 3,003 cc by increasing the engine bore by one quarter of a millimetre. This was done in August 1972 to allow the CSL to be raced in the three litre racing category, allowing for some increase in displacement in the racing cars. The modern Aston Martin DBS is a British high performance GT sports car version of the DB9 from the UK manufacturer Aston Martin. 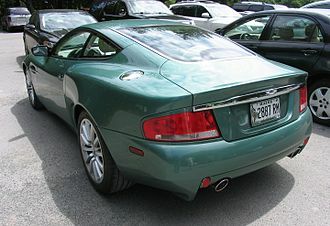 Aston has used the DBS name once before on their 1967–72 grand tourer coupe, the modern car replaces the 2004 Vanquish S as the flagship of the marque. DBS Volante includes a retractable fabric roof controlled by a button in the center console. The roof can be opened or closed while moving at speed up to 48 km/h. Apart from the roof, changes include a new wheel design available for both the coupe and volante versions and 2+2 seating configuration available for both versions. 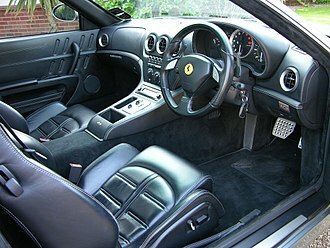 Other features include rear-mounted six-speed manual or optional six-speed ‘Touchtronic’ automatic gearbox, the vehicle was unveiled in 2009 Geneva Motor Show on 3 March 2009, followed by 2009 Concours dElegance. Delivery began during quarter three 2009, as of Q32010, Aston Martin has released two special editions of the DBS. Available for DBS and the V12 Vantage, the Carbon Black edition includes unique carbon black paint job, Touchtronic gearbox, obsidian black or orange interior and lightweight seats. DBS UB-2010 Limited Edition is a version of DBS Coupe and Volante convertible named after Dr. Ulrich Bez, CEO of Aston Martin Lagonda Limited. This edition comes with the Touchtronic gearbox or the manual upon request, azurite black exterior colour, blue brake calipers, DBS UB-2010 Limited Edition was unveiled in 80th Geneva Autosalon. The vehicle was unveiled in 2011 Frankfurt Motor Show, delivery began in the first quarter of 2012. 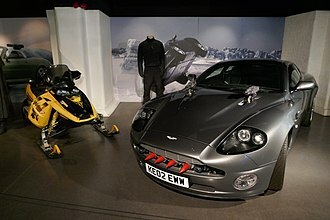 It is a version of DBS Volante to honour of the Year of the Dragon. The vehicle was unveiled in 2012 Beijing International Automotive Exhibition.9 in Length,185.9 in Width,75.0 in Height,50.4 in Graziano six-speed manual transaxle. Touchtronic 2 six-speed automatic transmission option, based on the same ZF transaxle unit that was developed for the DB9, was introduced in 2008, the DBS is equipped with 5935 cc V12 engine with four valves per cylinder. 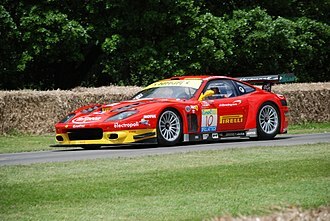 The same engine is used in the DBR9 and DBRS9 racing cars albeit with extensive modifications. The engine of the DBS produces 510 horsepower at 6500 rpm and 570 N·m of torque @5750 rpm with a ratio of 10.9,1. The Aston Martin V8 is an automobile which was manufactured by Aston Martin in the United Kingdom from 1969 to 1989. As with all traditional Aston Martins, it was entirely handbuilt – with each car requiring 1,200 man-hours to finish, Aston Martins customers had been clamouring for an eight-cylinder car for years, so Aston Martin designed a larger car. The engine was not ready, however, so in 1967 the company released the DBS with the straight-six Vantage engine from the DB6, two years later, Tadek Mareks V8 was ready, and Aston released the DBS V8. With the demise of the straight-six Vantage in 1973, the DBS V8, now restyled and called simply the Aston Martin V8 and it was retired in favour of the Virage in 1989. From 1969 through 1972, Astons flagship model was the DBS V8, though the body and name was shared with the six-cylinder DBS, the V8 sold for much more. The body was a modern reinterpretation of the traditional Aston Martin look, with a squared-off grille, distinguishing features of the V8 model are the larger front air dam and lack of wire wheels, though some six-cylinder DBS cars used the V8s alloy wheels. The tail lights were taken from the Hillman Hunter, other contributions to the weight gain included heavier ventilated brake discs, air conditioning, fatter tyres, a new and stronger ZF gearbox as well as some extra bodywork beneath the front bumper. Mareks V8 engine displaced 5.3 L and used Bosch fuel injection, output was not officially released, but estimates center around 315 hp. The DBS V8 could reach 60 mph in 5.9 seconds and had a top speed of nearly 160 mph, a DBS V8 was to be used by Roger Moore in the television show, The Persuaders. However, no V8 car was ready, so a six-cylinder DBS was modified to look like a V8 for use in the show. In April 1972, the DBS V8 became just the Aston Martin V8 as the six-cylinder DBS was dropped, leaving just this car, the V8 became known as the AM V8, a model retroactively referred to as the Series 2 V8 to separate it from models. 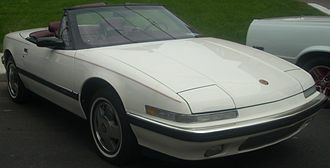 Visual differences included twin quartz headlights and a grille, a front design which was to last until the end of production in 1989. Vision EfficientDynamics concept vehicle unveiled at the 2009 International Motor Show Germany. BMW i8 Concept exhibited at the 2011 International Motor Show Germany.